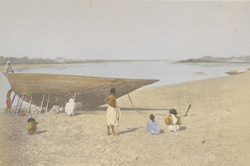 A hand-coloured print of a Dingy on the River Hooghly, from the Fiebig Collection: Views of Calcutta and Surrounding Districts, taken by Frederick Fiebig in 1851. This is a view of a dinghy being cleaned and repaired by workmen. A Dingy is a small boat of shallow draft with cross thwarts for seats.